I’m torn on the idea of graveyards. They were great for hide and seek. Testaments to lives, lived and lost. But for family grave plots? Or maybe just meditate on memories. How many headstones are forgotten? Let me tell you about one. A place settled by Allens in the late 1600s. On what was then called Madnan’s Neck. Started sometime by Daniel Allen in the early 1800s. For the upkeep of the cemetery. The money was never used. Spreading throughout Long Island and points west. Into a small triangle between two backyards. To make room for a new shed and swing set. Since their, no-doubt, well attended funerals. And reclaimed by the town. I heard no family stories about them. And why should it matter? 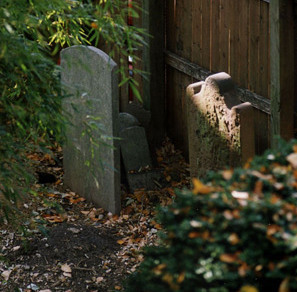 There’s renewed hope that plans for the restoration and preservation of the Allen Cemetery, a 20-foot by 10-foot abandoned property nextled between the backyards of two homes on Pearce Place in Great Neck Plaza can soon move forward. ed property nestled between the backyards of two homes on Pearce Place in Great Neck Plaza can soon move forward.